You would be purchasing an exact copy of the USS Rodman DMS 21 cruise book during this time period. Each page has been placed on a CD for years of enjoyable computer viewing. 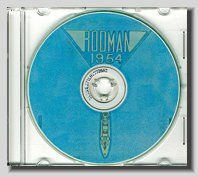 The CD comes in a plastic sleeve with a custom label. Every page has been enhanced and is readable. Rare cruise books like this sell for a hundred dollars or more when buying the actual hard copy if you can find one for sale. Ports of Call: <?xml:namespace prefix = "st1" ns = "urn:schemas-microsoft-com:office:smarttags" />Augusta Bay, Taranto, Greece, Genoa, Marseilles, Cartagena Spain and Leghorn Italy. Once you view this CD you will have a better idea of what life was like on this Destroyer Minesweeper.